Lush Fab Glam Inspired Lifestyle For The Modern Woman: From The Runway To Your Home: White And Gold Decor. 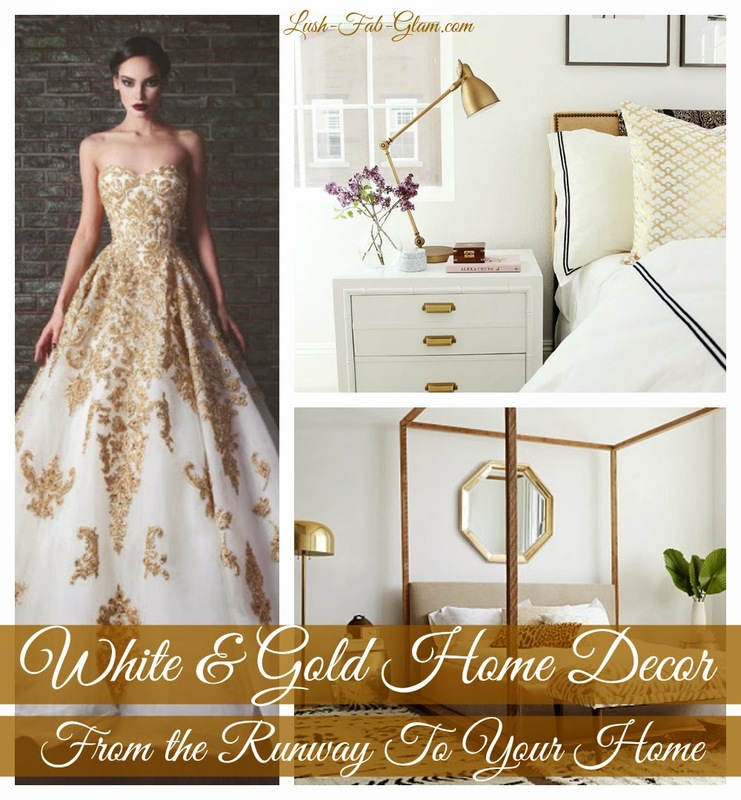 From The Runway To Your Home: White And Gold Decor. 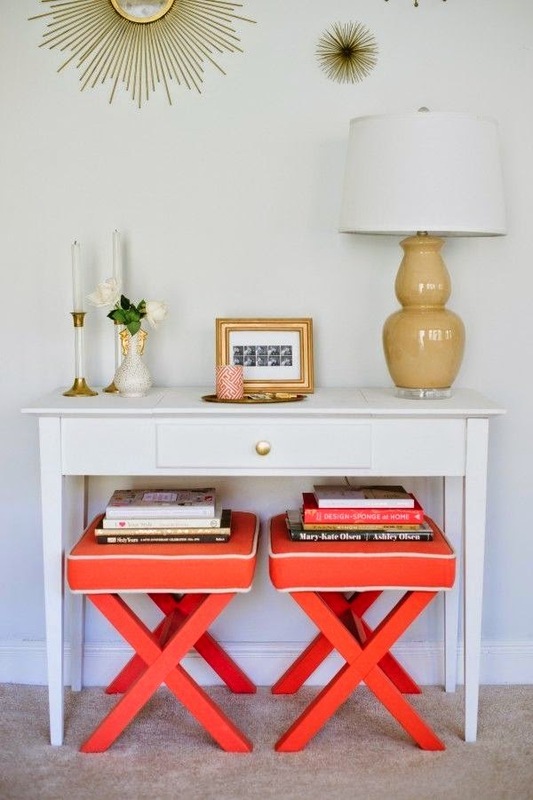 Easily give your home a cohesive sense of style with clean, light and airy white home decor that's perfect for the warm summer months, while adding an elegant touch with chic gold accents, home accessories, wall decor and more. 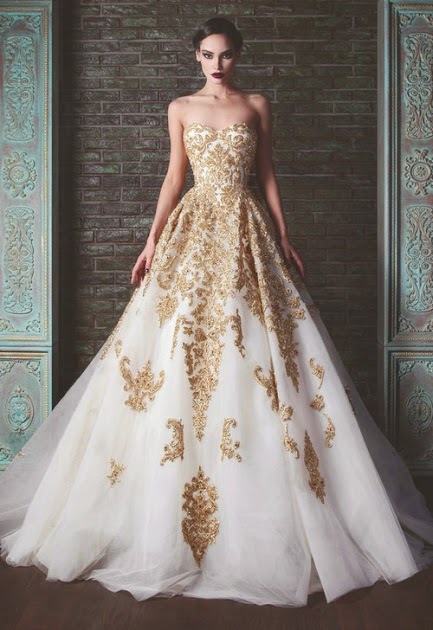 Beautiful white tulle gown embellished with gold. 1. 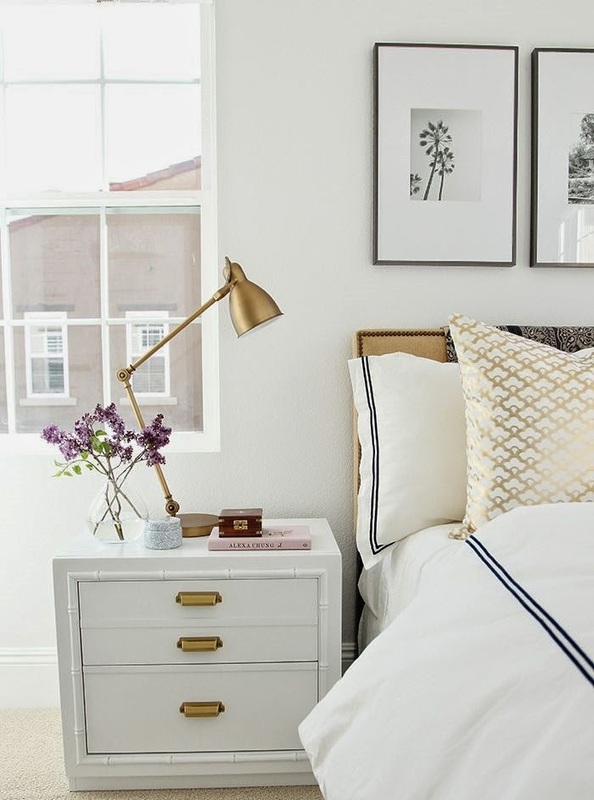 White & Gold Bedroom: The white room above was transformed by adding a few simple accents like an antique gold night lamp, gold fixtures for the night stand, a gold headboard and throw pillows embellished with gold graphics for a minimal look. 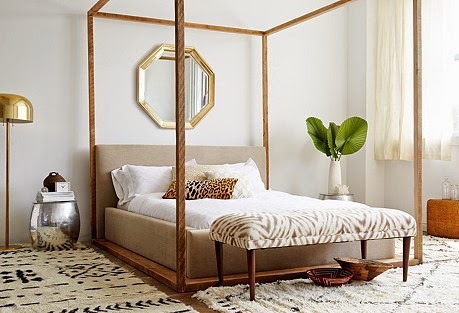 In the bedroom below gold decor was used to make a bold statement with the large gold mirror placed above the bed complemented by a beautiful vintage gold floor lamp. 2. White & Gold Foyer: Make your foyer or entry way in your home inviting by adding a white console and gold wall accessories like a sun rays clock or mirror, along with desktop decor like a picture frame and gold embellished candle holders as shown in the photo above. 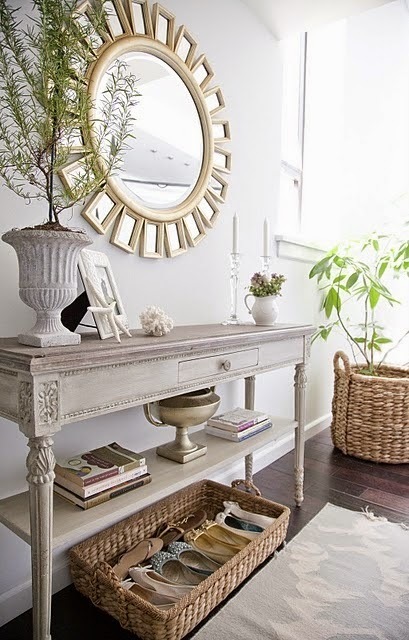 Or give your space a shabby chic design with antique white furniture for that lived-in look and use matte gold decor like a mirror, jar and even books with gold accents to complete your home design as shown below. 3. White & Gold Living Room: White and gold is the perfect way to create an eclectic design in your living room since both colors complement all shades and hues. Have fun with your decor by mixing bold animal prints with graphic lines in your rug. 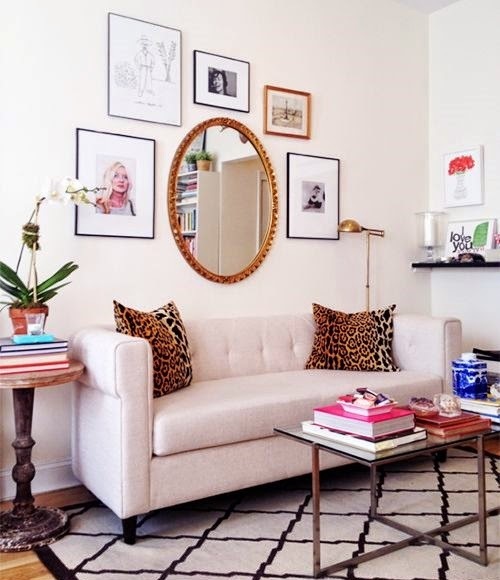 Add pops of color with vases, books and photos and tie your design together with a few statement gold pieces like a large wall mirror and photo frame. 4. 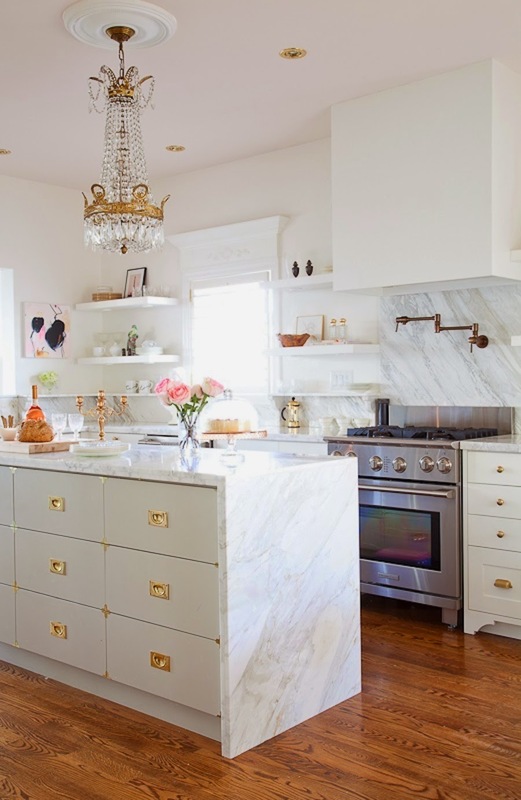 White & Gold Kitchen: This beautiful white and gold kitchen previously featured in our Friday Faves posts, is a perfect example of how to attain Parisian-chic decor in your all white kitchen by adding gold draw handles and decorating with gold candelabras and a statement crystal and gold chandelier. Which white and gold room design do you love? Share with us by leaving a comment below.